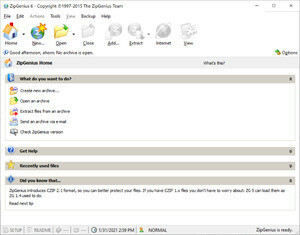 ZipGenius is an archive management program developed by Italian company WinInizio. It was designed with extreme ease-of-use in mind and includes almost all features you'd expect to find in a commercial program, the difference being is that ZipGenius is completely free. It is not only free for personal and home office use, but also free to use on an unlimited number of workstations in a business setting. Using this program, you can expect ZipGenius to support virtually any type of archive among the most popular being ZIP, JAR, RAR, TAR, CAB and 7Zip archives. Version 6.3.2.3116 is a freeware program which does not have restrictions and it's free so it doesn't cost anything. For security reasons, you should also check out the ZipGenius download at LO4D.com which includes virus and malware tests. Additional screenshots of this application download may be available, too. ZipGenius has a presence on social networks.